The “Bank Technique” of Azerbaijan was founded in the first years of independence. Following the successful rebranding in 2012, the development concept of the Bank focuses on modernity, technologies and innovations. “Bank Technique” carries out all the main banking operations, offered in the financial services market, including performance of services for individual and corporate customers. According to the results of the first half of 2013, the capital assets of the Bank have exceeded 65 million USD with an income of 23 million USD. We talked to the “Bank Technique” chairman of board, Ulvi Mansurov, about the economy in Azerbaijan, the role of the Bank, its development and future plans. 1. How does Bank Technique support the socio-economic development in Azerbaijan? As you perfectly know, the large-scale reforms carried out in Azerbaijan have created favorable conditions for the acceleration of economic development. Large infrastructural and construction projects have been started in the country. The role of the financial institutions grows in the background of the increasing competitive ability of the economy. “Bank Technique”, which has been consistently in the top ten of the largest banks of Azerbaijan according to main financial indicators, is involved in a number of large infrastructural projects. The investments of the bank in different spheres of economy, including construction, agriculture and light industry, are not only profitable, but also contribute to the economy of the country as a whole. Other than that, following its development strategy, “Bank Technique” strictly abides by the foundations of corporate social responsibility. The bank frequently makes contributions into child healthcare, orphanages, lonely elderly people, the disabled and allocates significant amounts to supports sports, culture and education in Azerbaijan. 2. Technology plays significant role in banking, how does Bank Technique meet the challenges of IT development? Indeed, our reality is such that progress cannot be imagined without the IT. “Bank Technique” tries to position itself as an innovative bank for everybody. At the bank we are sure that technological development and modernization of banking services offer great opportunities in our competitive environment. Today the main priority of the bank ceases to be a network of branches only, but rather a smartly developed system of customer care through internet and mobile channels. We have already managed to complete the first stage, where we have launched a platform for internet banking and introduced mobile banking and an interactive website with the system of “Personal cabinet”. 3. Are there any ongoing projects that you would like to share with us? At the moment the main task for the management of the Bank is the shift of consumer care on a remote basis. Towards the end of the year we are planning to complete the installment of the most advanced module for internet banking, which will allow us shifting into a new level of remote banking. With this scenario almost all banking services will be shifted to remote-technological platform. This in turn will increase the speed of money circulation by multiple times. 4. What are your future plans for sustainable development? Following the strategy, Bank Technique strives for efficient development, targeted at increasing the income significantly, improving the quality of structure and upping the efficiency of the bank. The main directions of the strategic plan, as I mentioned above, are innovative-technological development of the Bank and improvement of full-functional remote banking. The experts of the bank constantly follow the latest trends in the world banking market in order to adapt and introduce the best and progressive systems and products that would meet the demands of our customers. Ulvi Mansurov has been appointed the chairman of board at “Bank Technique” since 2012. 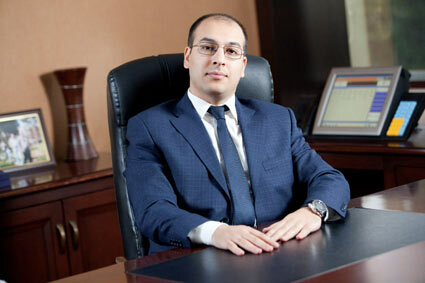 He previously worked at the International Bank of Azerbaijan from 2001 to 2012, with his last position being the deputy director of the Finance Department. He has majored in economy. At present he continues his education in the MBA program at the Business School at University of Warwick.